While we are on the subject of my dad and what famous person he looks like (o.k. Maybe you have all moved on and I haven't...) I would be remiss if I didn't share these pictures with you. You see, my dad may have looked like Magnum P.I. 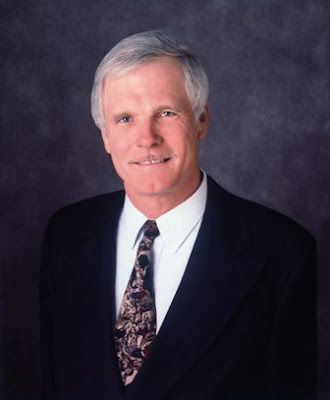 in his early days, but in his more mature years he's a dead ringer for Ted Turner. No joke. My parents were at a gas station once. My dad was outside pumping gas while my mom was inside (probably buying a Snickers bar...cause that's what we do...). All of the sudden there was a flurry of voices and people gaping out of the window. "Oh my gosh! Is that Ted Turner! I think that's Ted Turner!" My mom excitedly joined the gawking. Desperately searching for Ted, she slowly realized that they were talking about her husband! "That's no Ted Turner. That's my husband!" She sarcastically informed them. A new millenium, a new doppleganger. You decide. Briggs was perfectly fine. Of course. And Luigi!!! He doesn't start Preschool until next week, but we still needed to take his picture! In comparing this picture of me going into 3rd grade with that of my dad, Tom Sellek, it's obvious that we fully embraced the '80's. 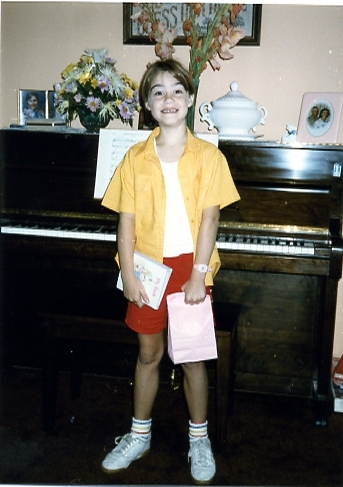 Please note the Reeboks. 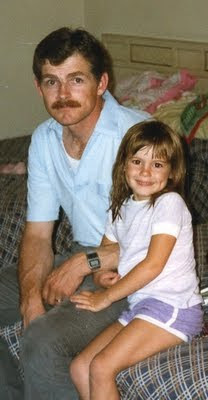 My sister had this picture on her blog of her and our dad taken years ago. I always thought my dad was Magnum P.I. It's back to school time (I know. I sound like a Kmart add...) and we are trying to get things in order around here after a gloriously free summer. Despite my long suffering and chronic nightmares proceeding the first day of school, I love the idea of getting ready to learn new things, but mostly starting fresh. I love the movie "You've got mail" and how it starts with her reveling in fall and back to school. She's walking around New York City with a bouquet of pencils. That image for me is always so strong (even though I've never been to New York) because I can identify with what she is feeling at that moment. I can even smell the pencils (all pencils smell the same, right?!) and feel that newness and freshness in the air. I'm hoping and praying that "New" will be good this year and that we can roll with it and grow a little. And to illustrate this willingness to embrace "New", I give you the newest peice of furniture in our household, The Backpack Cubbies a la Pottery Brian. Brian re-engineered our old toy box one Saturday and came up with this new lovely. I am so impressed with his workmanship and how he seamlessly meshed Old with New. Let's pretend that I'm giving you all pencil bouquets so you can smell the freshness of change. Ashlynn came bouncing downstairs this morning, dressed up all nice for her big day of events. She's always good about saying goodbye and today was no different. She gave me a big kiss and hug goodbye. As I hugged her I tugged up at the back of her skirt and said, "Just checking to make sure you have your monkey bar buddies on." To which she backed up, replied, hand on the hip, dead serious as could be, "Dad. The clothing stores (pause) are smart enough to know (pause) to put shorts built into the skirts(pause), so daddies like you don't let their daughters underwear show to the world!" Ahhh, the savory taste of a sweet fatherly victory. I do believe we're finally getting somewhere. One of the things that brings me the most joy is watching my kids play with cousins. They are so lucky to have cousins on both sides of the family that are very close in age to them. This was no exception in Washington. Brian grew up spending summers with his cousin, Rob, who is just 6 weeks younger than him. It was so fun to see the next generation getting to know each other. Briggs and Kai are just 2 weeks apart in age, and Ty and Amara are 3 months apart. I'm so glad we got the opportunity to spend time with them. Ashlynn really stepped up and took the roll of big sister really well with Amara. The 5 year olds, both tall, skinny and sweet little boys! All six of the kids on the bulk head with the cabin in the background. Playing some game that made Amara giggle! Brian and Rob, the first generation of cousins! I've been gone at girls camp for a week and I'm still trying to get my feet under me, but I thought I'd leave you with some words of wisdom from Ty until I can update some pictures. Ty likes to help me make dinner. This is usually a good thing because it keeps him from causing trouble in another part of the house. However, this usually means I have to find some mundane and harmless task to keep him busy in the kitchen. So last week, he was putting the corn for that nights dinner on a platter. He decided to take it one step further and pick all of the corn silk off. "Ooh! This is hard work! This is what Beavers do! Except they do it with logs!" Here's to the Beavers (and the moms) in this world who work hard. I had to share some pictures of the qulit I made my friend's little girl. 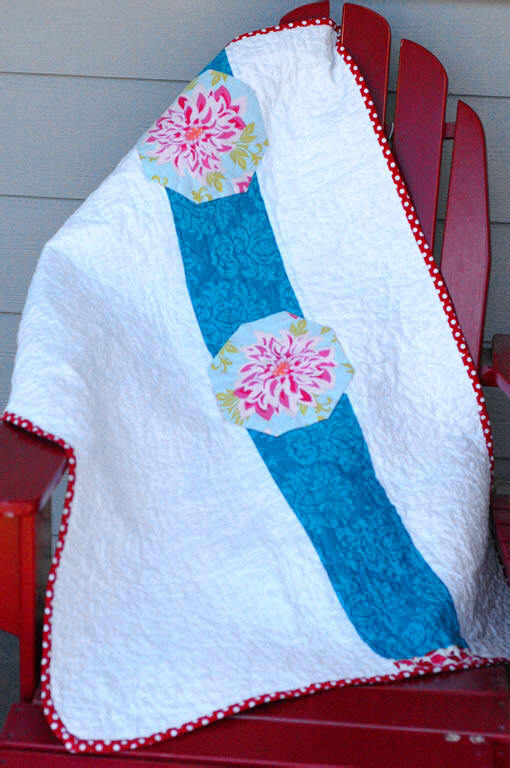 This was the first quilt I made trying to be creative with my machine quilting. The meandering stitch was the best I could do. 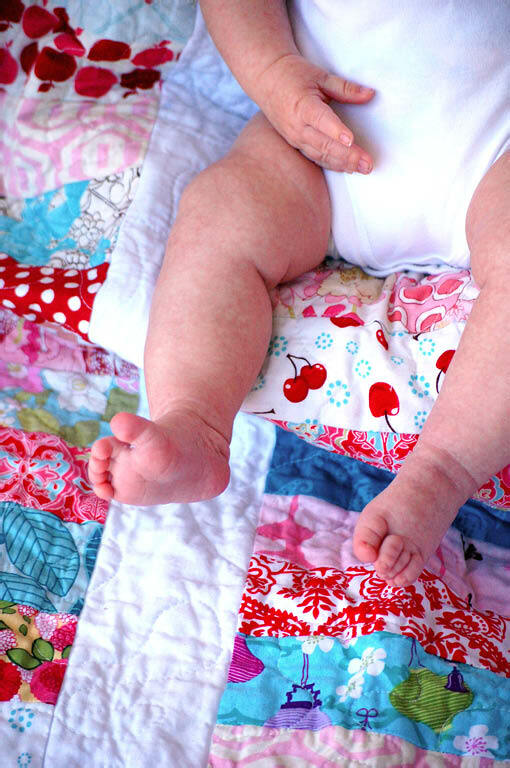 I would love to get my quilts professionally quilted, but I haven't been able to locate anyone affordable in this area. I called one lady who quoted me $150!!! 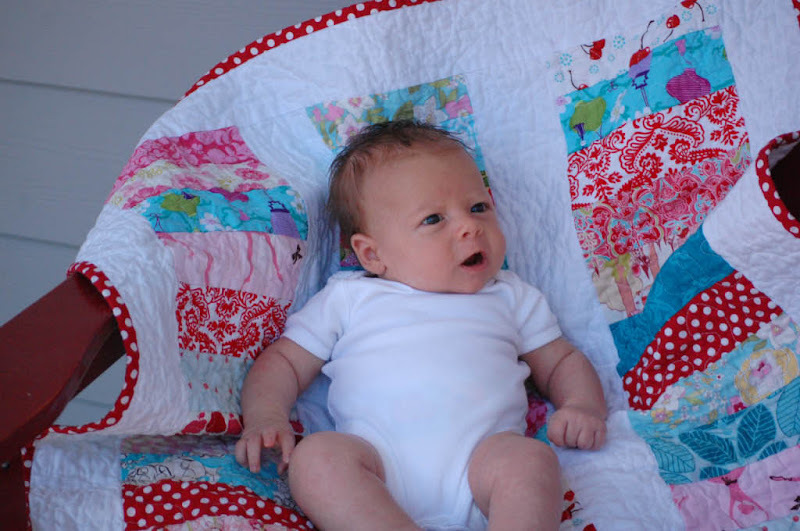 for this little quilt!! That's when I got on line and watched a bunch of tutorials on how to do it myself without a fancy machine. So there's me tooting my own horn. p.s.I got the design idea from one of my favorite sites, Handmade by Alissa. 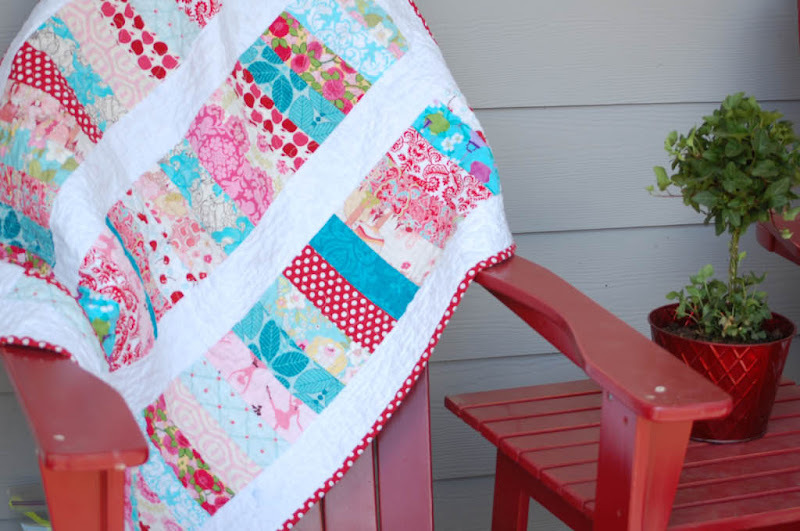 I love her use of a wide variety of fabric all in one quilt. The kids loved the boat at the Lake. They loved to ride right up front and go fast, so that the wind and the spray hit their faces. They loved to snuggle up with Aunt Linda under a blanket and fall asleep during an evening cruise around the lake. They loved to giggle with their cousin Kai (the little blond one in the pictures who is only 2 weeks younger than Briggs). They loved to be towed behind the boat in a tube. Brian said the kids were exactly like himself as a kid - always begging the parents to fire up the boat!